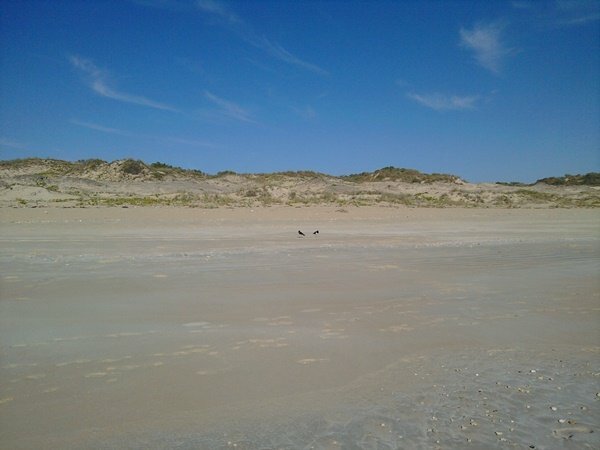 I have observed Pied Oystercatchers breeding in an area on Cable Beach since July 2000. The birds have moved the nest site slightly each year depending on human interaction, but it is still confined to one small section of grey rocky outcrops with a great view for sitting for 28 days. Interesting observations have shown that a female bird will actually give up her territory if her partner does not suit and move to a new location. There have been successes some years at this location, but sadly this year the birds lost both of their attempts at breeding to predation. The beach is very wide and offers suitable food and habitat for hiding the chicks, but it does also come with the risks of the nearby bush and I have seen a Brown Goshawk in the area on a regular basis. 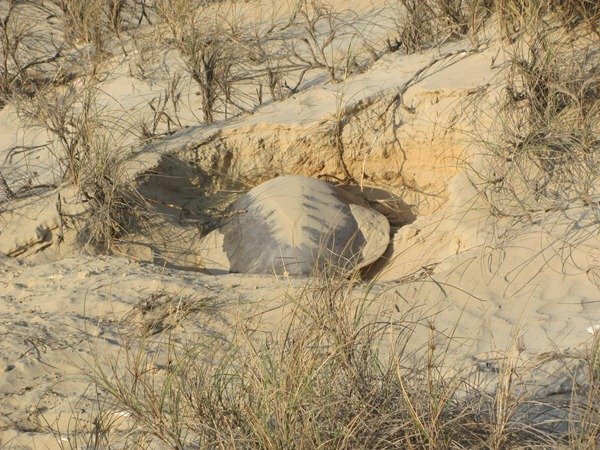 We are now at the time of year when Flatback Turtles come ashore to lay their eggs along our coastline and they usually do it during the night around high tide. Recently, however, we got a call to say that a Flatback Turtle was coming out of the sea at 2:30pm! High tide was at 3:40pm, so she was taking advantage of the shorter struggle up the beach, but it was still a long way to get above the high tide mark. 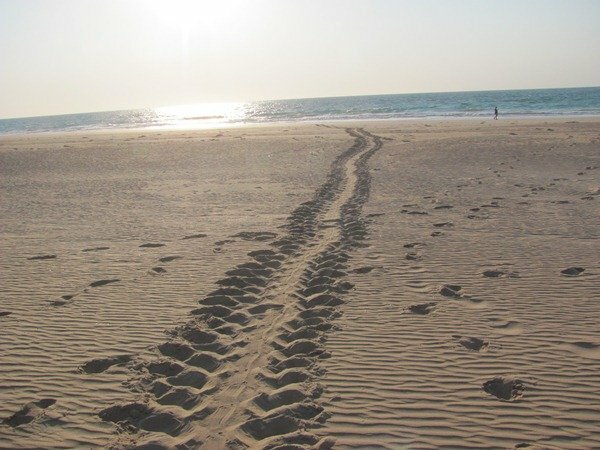 The tracks are significant and could hardly be missed by even unobservant people that walk the beach late in the afternoon. 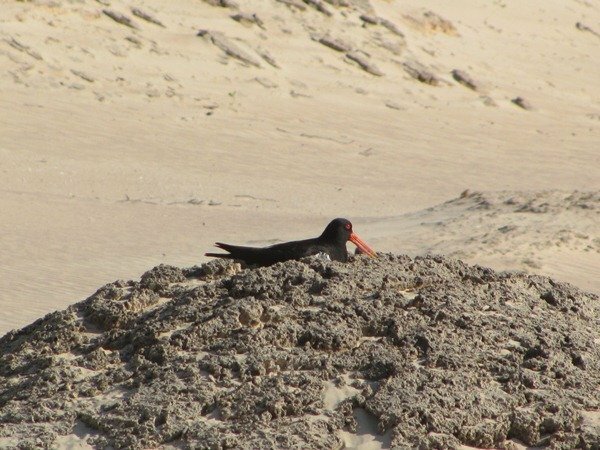 She had chosen our Pied Oystercatcher breeding site! 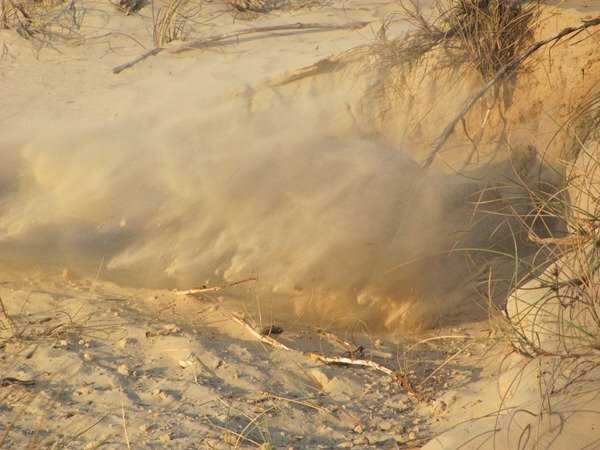 It was about 5:30pm by the time we were able to get to the location and she had dug quite a large hole, but was struggling with soft sand that kept falling in on her. Usually this all happens at night and can only be seen by moonlight, so this was a privilege. 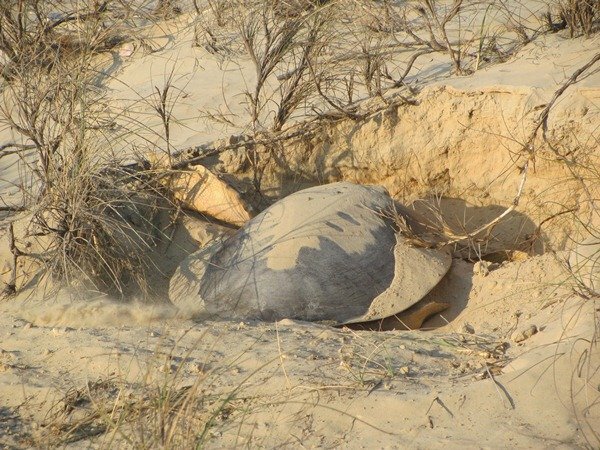 If the turtle is unable to perfect the nest in the first location she will attempt again in another location nearby or even give up altogether and return another night. There was a lot of sand to shift and she did it with big sweeps of her flippers. Once she had dug out a big hole and felt it was suitable she then set to digging a pit with her back flippers to lay her eggs into. We did not stay until the very end process as we thought it nicer to leave her in peace. Apparently the eggs were laid and she finally returned to the sea at 7pm. 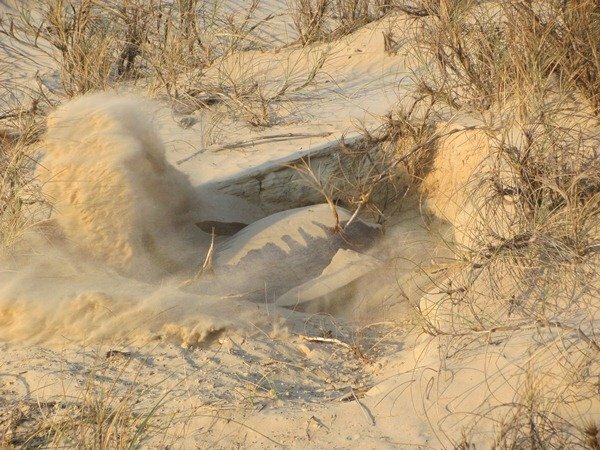 She had spent 4 1/2 hours on getting up above the high tide mark, digging a hole and egg chamber, laying her eggs and then the longer walk back to the sea. We left as the sun went down and it was spectacular as always. 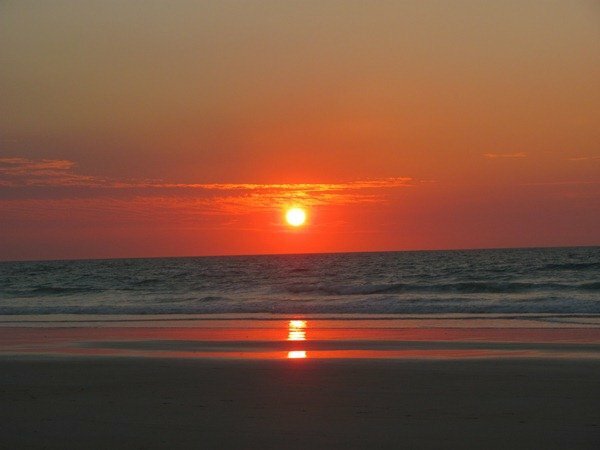 The sun setting into the sea is always special! 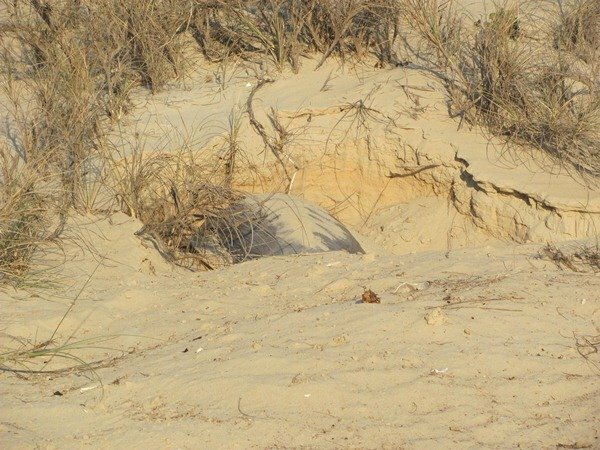 The eggs should hatch out in 45 days and the temperature of the sand will determine if the turtles are male or female. They will head for the sea and not return to land unless they are female and that will be many years into the future. The risk of predation is high even before they make it to the sea and so about one hundred eggs are laid by the female. So, our beach nesting has changed from birds nesting to turtles nesting! 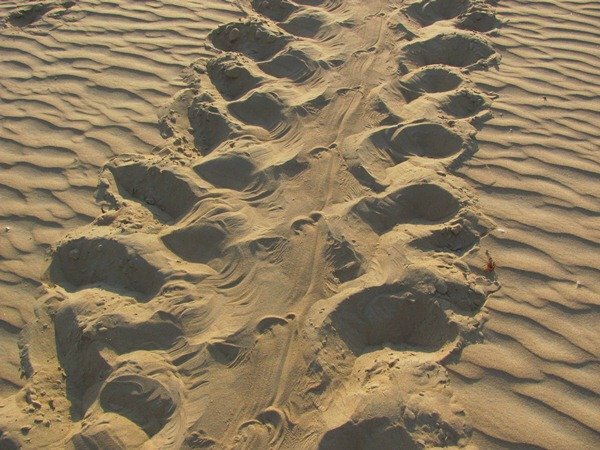 Wonderful photos of the turtle’s tracks, which look almost like jeep tracks, and of the turtle burying itself. Thank you!